For Samuel Simmens, PhD, M.A., his exploration of public health research has always been one from a quantitative point of view. With a PhD from New York University in Community and Quantitative Psychology, Dr. Simmens believes that his formal educational background combines well with his exploratory work in public health to support a wide array of multi-disciplinary research. 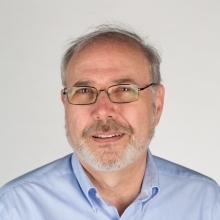 As such, Dr. Simmens has provided biostatistical consulting in all areas of health research over the years, including basic lab sciences, clinical research, and health policy research, making him a valuable asset to both the DC CFAR and the George Washington University (GW). Now the Co-Director of the Clinical and Population Sciences Core and Research Professor in the Department of Epidemiology and Biostatistics at GW, Dr. Simmens focuses on how to best use multi-disciplinary statistical methods and approaches to assist other researchers. This skillset is how he has segued into HIV research.As a consulting biostatistician, Dr. Simmens became involved in behavioral research at GW regarding adherence among adolescents some 15 years ago. Since then, Dr. Simmens has refined the statistical approaches from various areas of research, including HIV research, and now advises researchers on incorporating best practices across multiple disciplines. While Dr. Simmens notes that his educational background provides him great insight into projects through a behavioral approach, he “thoroughly enjoys serving the needs of the entire CFAR membership, regardless of the concentration of the projects.” In recent years, Dr. Simmens has also spent considerable time providing mentorship to many early stage investigators on formulating study aims that align with the study design and statistical analysis of their research. In the future, Dr. Simmens looks forward to developing this skillset further, as well as supporting the development of best practices and biostatistical approaches for all CFAR members, with a particular emphasis on pilot and early studies. As a leader within the DC D-CFAR, Dr. Simmens is dedicated to helping investigators develop high quality studies through efficient use of their data.